Admiralty Sales And Services, Inc.
Admiralty Sales & Services, Inc. is an authorized dealer for the Acadia 25, 21 Launch, Pompano 21 and the New Pompano 23. We are conveniently located just minutes north of Jacksonville International Airport and a short drive from I-95 to Fernandina Beach, Florida. We will gladly pick up and drop off at the airport. Check out the new 2015 Pompano 23 with a Yamaha gasoline outboard engine available for your inspection and demonstration. Admiralty Sales is excited to be able to introduce this new addition to the fine line of Atlas boats to our customers. Coming Soon! The new Acadia 25 powered by a gasoline outboard engine. 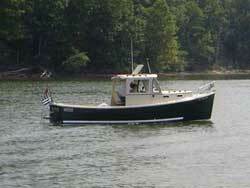 Order your semi-custom Atlas boat and have it in the water usually within 8 weeks. Please review the specifications, standard equipment list, options available and pricing by clicking on the provided links. Before you buy elsewhere, let Admiralty Sales & Services give you a confirmed quote. We will not be undersold. We Buy Pre-owned Acadia’s and Pompano’s. In addition to ordering your new Atlas boat, we also buy and sell pre-owned boats. If you don’t want to wait 6 months or more to sell your Acadia or Pompano, let us buy your boat. It’s fast, simple and you get your cash immediately. Click on the models below for pictures, specifications, standard equipment list, popular options and pricing. POMPANO 23’ - Now available! This solid, soft riding down east hull is now available as an outboard powered version of the Pompano 21’. 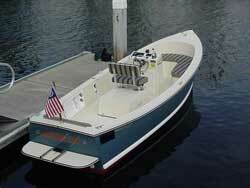 The popular pilothouse- cabin boat with the integral molded hull extension; incorporates the outboard transom and swim platform transforming it into the Pompano 23’. The integral hull extension provides the added buoyancy to support and balance the outboard version. Other builders simply cut the transom or add a bracket; this integral hull extension transforms the boat into a true outboard set-up and retains full use of the aft deck area. The standard boat is equipped with the Yamaha 70hp 4 stroke outboard. Smooth, quiet, lightweight, and efficient, it provides ample performance and economical operation. Overall boat weight is lower as is the price! 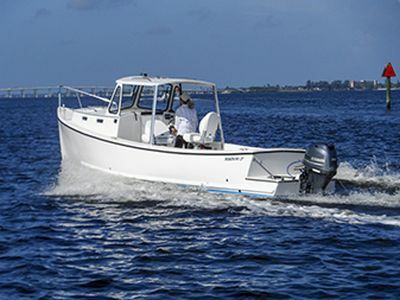 Your Pompano 23 can be built without power for later power selection by the engine dealer of choice or installed by the builder with a variety of other outboard engines. Call Admiralty Sales & Services, Inc., your east coast dealer for all Atlas models, for a demonstration and a firm quote. The Acadia 25is built by Atlas Boat Works, Inc. along the lines of a traditional lobster boat, is trailerable and will meet the demands of the weekender, cruiser or sports fisherman. The Acadia 25 combines the rugged construction of a work boat with the polished finish of a quality yacht. Powered by dependable Yanmar marine diesel engines, the Acadia can cruise easily at 20 knots plus. The semi-displacement hull shape has a reputation for maintaining good speed in rough water and providing a soft ride. The full length keel and skeg protect the propeller, shaft, and the rudder during grounding. This affords the owner peace of mind seldom found in power boats. Features include a large aft cockpit, a pilothouse that provides protection from the weather, enclosed cabin with standing headroom, head and shower, and a galley with sink and portable stove. The hull is solid fiberglass with HYDREX vinylester skin, completely hand-laid with multidimentional and unidirectional fibers to guarantee a uniform laminate structure. Honeycomb “Nida-Core” provides the strength for all decks and “Starboard” composite plastic give the Acadia clean looking, and mildew/rot-proof bulkheads. These modern materials, experienced boat-building craftsmanship, and attention to detail are the ingredients to the Acadia’s success. The Pompano 21is the smaller sister ship of the Acadia 25. The Pompano is also built by Atlas along the same lines of a traditional lobster boat. The Pompano is powered by a dependable Yanmar diesel engine and is capable of 14 knot plus cruise speeds. The Pompano 21 features a full length keel, and rides well in rough water. There is standing headroom at the helm station and the aft deck is self-bailing. The forward cuddy cabin provides sleeping accommodations for two, a molded galley unit, and a porta-potti. Generous storage areas below the berths and rope locker forward. Trailering is hassle free with a dry weight of about 2,400 lbs. 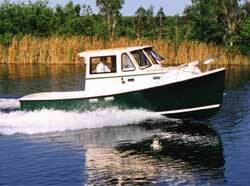 The Pompano 21 is constructed in a similar fashion to the Acadia and utilizes the highest quality materials. The Acadia 21 Launchis a center console boat with an inboard diesel and semi-displacement hull shape. It’s the same seaworthy hull as the Pompano and will provide safe and dependable boating. The Launch is great for the fisherman or picnic-boater looking for the reliability of a diesel engine. With a 2’ draft you can get where the fish are or just explore those shallow creeks.